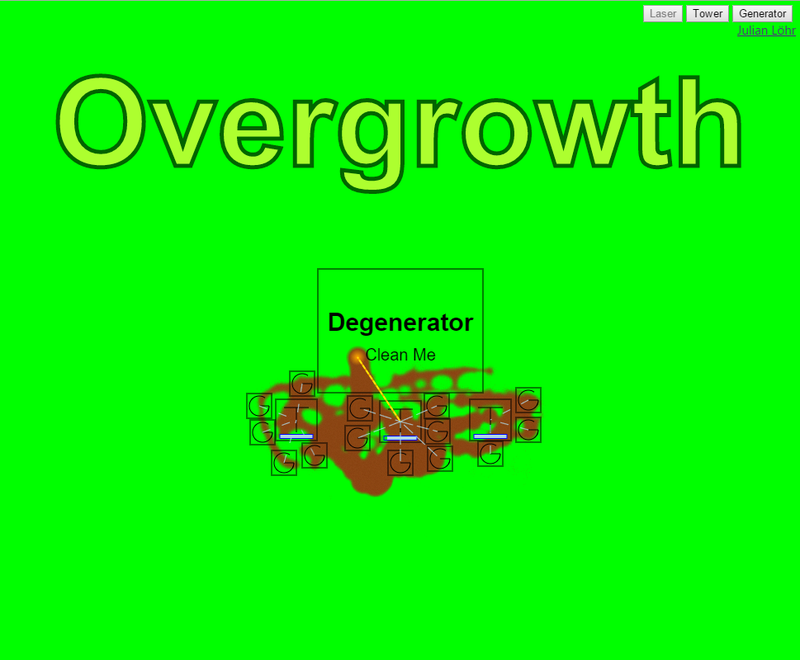 Overgrowth is my game for the Sonen GameJam at University of Oslo in Fall 2015. Synopsis: The map is wasteland like, that has been left and abandoned after some sort of catastrophe (let it be a nuclear disaster). The green stuff is kind of radiation empowered fauna. It grows quickly and aggressively. Your task is to reclaim the area, by activating the “Degenerator”. Gameplay: You have towers (boxes with T inside) that can shoot lasers to remove the overgrowth. Those towers have an energy pool that gets drained when shooting the laser. The energy is replenished by connected generators (smaller boxes with G inside). When a building is covered by the green stuff up to a certain percentage, it stops working. So don’t forget to clean your buildings regularly. In the top right corner are three “skills”. The first one is the ordinary laser. The second and third one are construction skills, to place new towers and generators. Towers can be placed anywhere on the map (i think there is a but near the edges of the map). But remember that they are inactive when covered by green. Generators must be placed within a certain range to towers and automatically connect to the nearest tower. Task: You main goal is to clean the “Degenerator” so it gets activated. It does not need any generators. When activated it starts working and clears the wasteland. You loose if your last tower is deactivated by the overgrowth.